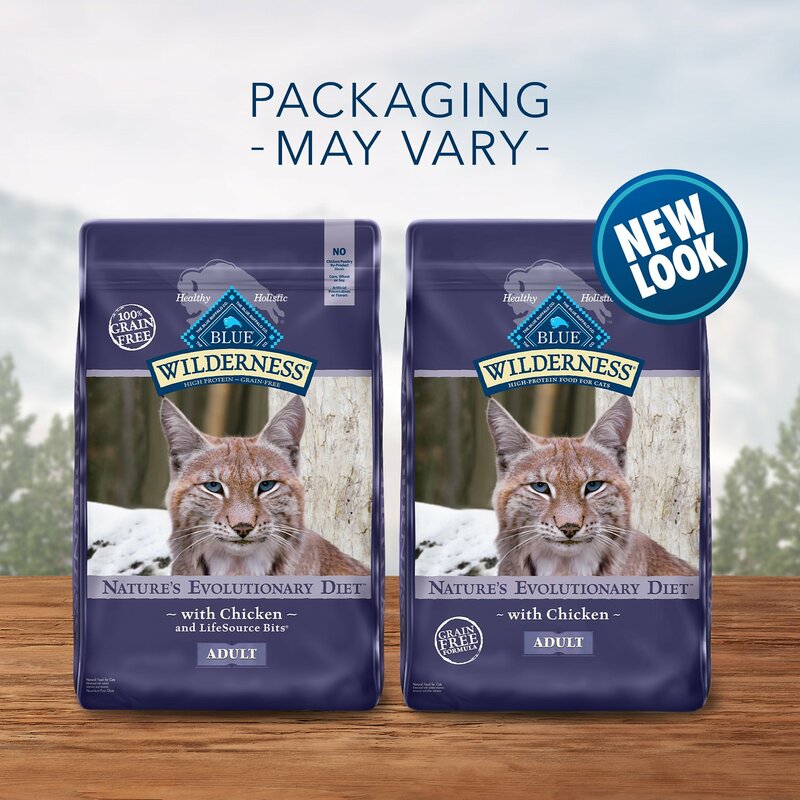 Feed your kitty’s wild side with the high-protein nutrition of Blue Buffalo Wilderness Chicken Recipe Grain-Free Dry Cat Food. 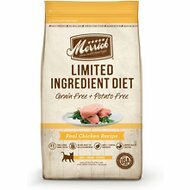 Made with real chicken as the first ingredient and never any grains, wheat or by-products, it packs a powerful protein punch to support your little hunter’s overall health and satisfy his cravings for meat with every bowl. 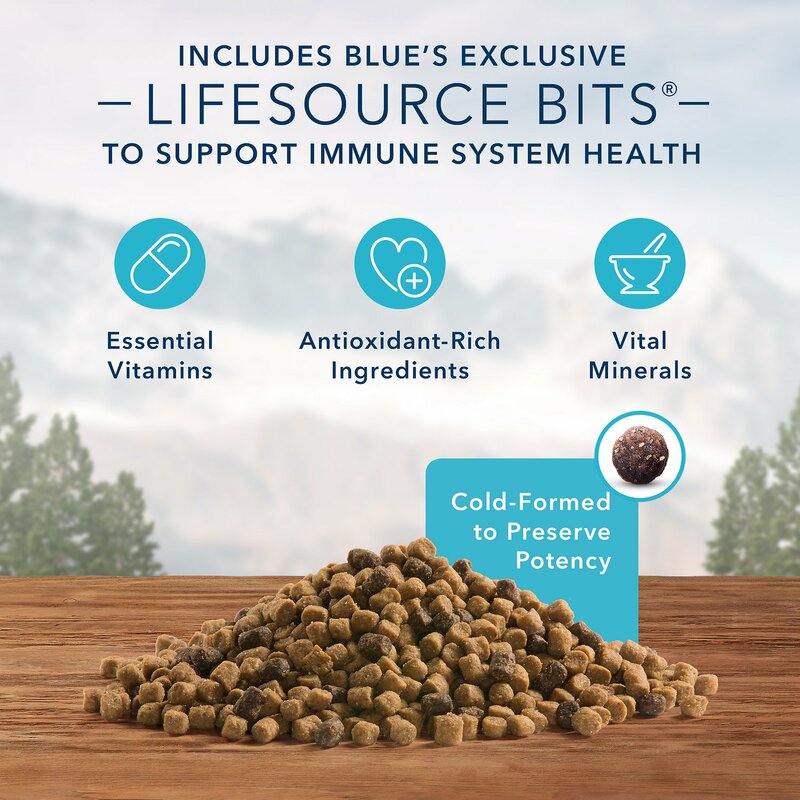 It’s loaded with antioxidant-rich LifeSource Bits―a unique blend of vitamins and minerals to support immunity―plus omegas, taurine and essential amino acids for a complete, well-rounded diet for cats of all ages. Plus, it helps maintain healthy digestion for happy tummies with prebiotic fibers in every bite. 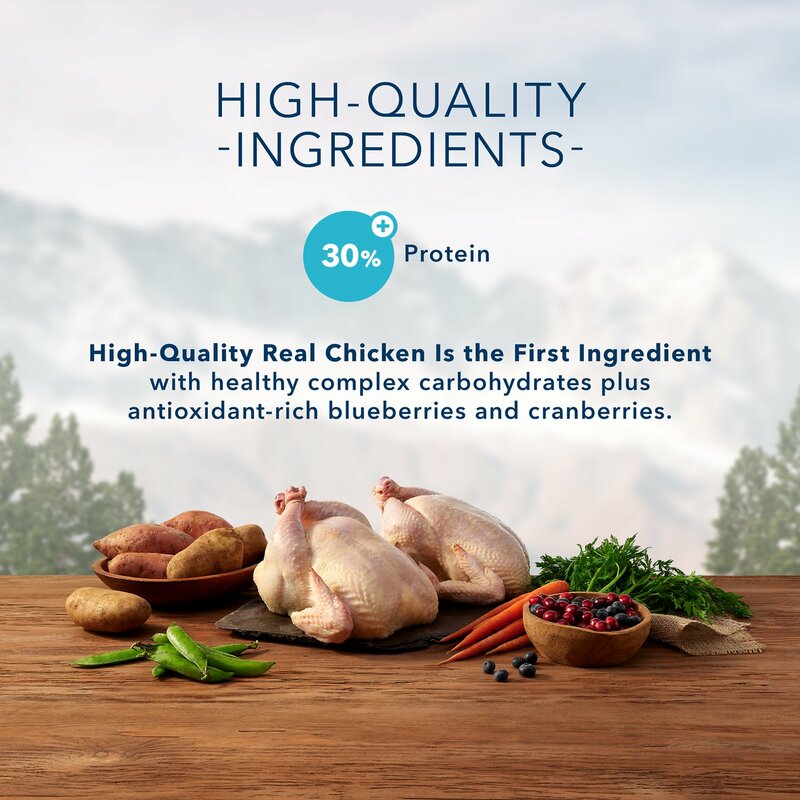 100% grain-free recipe starts with protein-rich chicken as the first ingredient to support healthy muscle growth and development. Supports healthy digestion and nutrient absorption with prebiotic fibers, and helps maintain an ideal weight with balanced calories from proteins and fats. Loaded with taurine―an amino acid essential to kitty health―to help support eye and heart health. 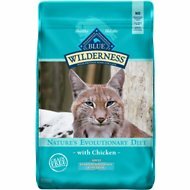 I'd been feeding my cat Iams Dry with no problems but, after watching a lot of Blue Buffalo commercials, I decided I wanted to give him what appeared to be a more nutritious food. Problem is he doesn't like it. I think the very small size of the kibble may be part of his dislike. The only way I can get him to eat any of it is to mix it with his old kibble. Of course I bought the large bag. I may end up donating it to the local shelter. I wish they offered sample size bags so you could try a more expensive/better balanced brand to find out if your cat's going to like it before investing in a large bag. 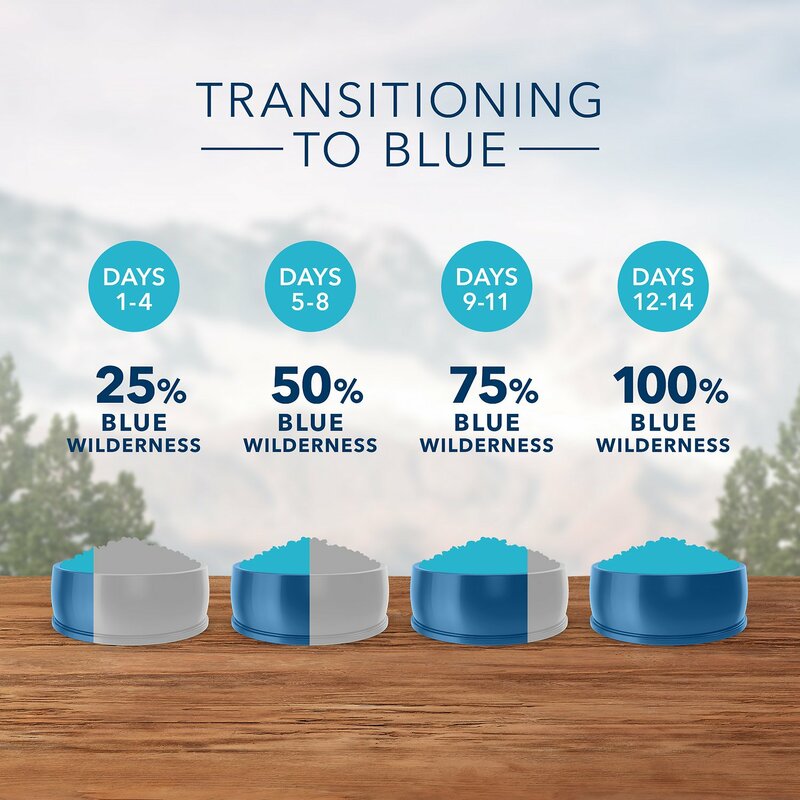 I switched our cats to Blue Buffalo Wilderness Grain-Free because the price of our previous premium cat food sky-rocketed! The cats liked that one but it wasn't worth the price increase. So, I did my research and chose this. They were slowly transitioned to this new food and are now eating it 100% of the time. No local vendor can beat Chewy's prices! But the key to choosing this food was the nutrition: high protein, grain-free. I was giving my cats blue buffalo basics and they finally revolted. Paws down all the way. Tried to cover it like it was something in the litter box. This week I purchased the blue buffalo wilderness and totally different story. My furbabies attacked the bowl and ate every morsel. I love the quality and they love the taste. 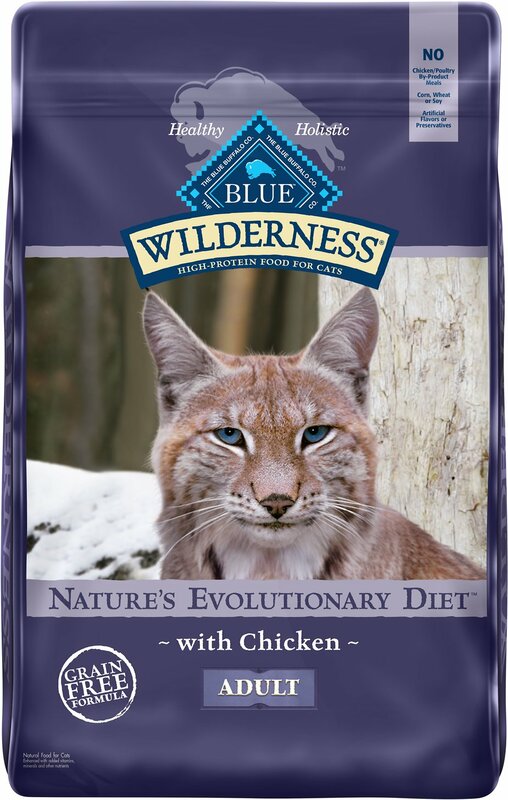 My cats love the Blue Wilderness food. I also like that the kibble is really small, so it is easy for my 20 year old lady cat to eat, she's missing several teeth. I free feed this all day and supplement with wet food. My cats love this food. I order all my pet supplies from Chewy and now that we have rescued kittens, now grown, this is the only brand I buy for them along with another Blue Wilderness product for one of my dogs. You can't beat the quality of these products. Every bag is fresh as if you purchased from a pet store. Went through 5 different dry foods before I finally tried this. A food both little Miss Confetti and I like that doesn't make her unbelievably farty (yes this was a problem with 2 different foods). Good ingredients and based on them empty bowl each morning it must taste good. I didn't slowly introduce it like you're supposed to. I set a bowl of Blue Buffalo beside my cats regular food. Even though they had access to their regular food, they preferred Blue Buffalo.